Sitting on a boat in the middle of the lake fishing, a light rainbow started to form. I was just in the right place at the right time and snapped this photo, with the colors reflecting in the grey water. Rainbows are beautiful and pretty rare out here on the east coast, not like the PNW. I love how you got the reflection in the lake as well! Nothing nicer than a rainbow and its reflection! Very cool photo. Lovely capture and what a delightful way to brighten up our gray skies!! Hope you have a lovely weekend! As if sitting in the middle of a lake isn't wonderful enough, you get a glimpse of sunshine plus a rainbow. tranquil scene. the rainbow is a bonus. Oh wow, I am getting to see a lot of wonderfully captured rainbows this past few days. Well done! Lovley capture of the rainbow and the neat reflection! Happy skywatching! Oh and here comes another rainbow! I won't mind being in the same place wathching till it fades out. 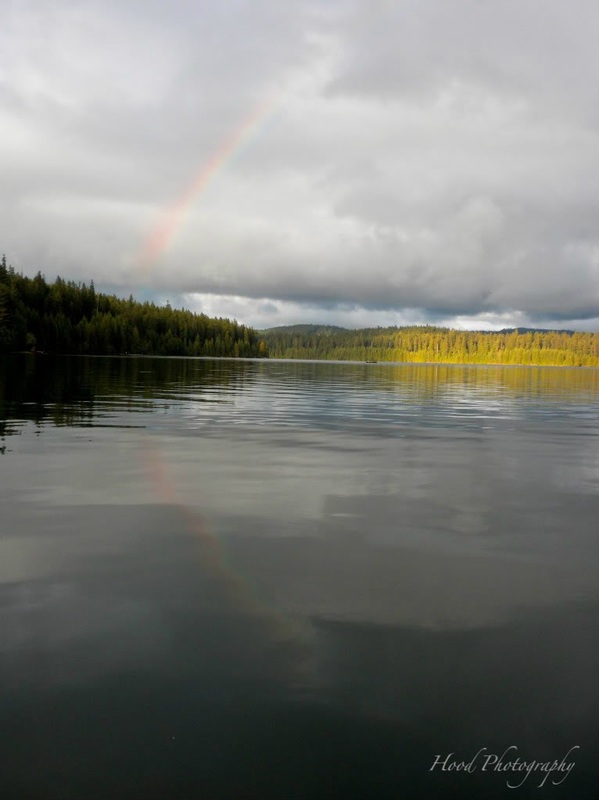 Part of the both the charm and drudgery of the PNW, gray and rainy accented by rainbows. Great capture of the double image. Hope you caught some fish. A beautiful reflection - a very cool composition! right place, right time, good eye. happy SWF. Superb shot. I love the different patches of colour forming the whole. This skywatch seems to be full of rainbows, even from the antipodes where we are in the middle of winter. Beautiful reflection in the water.